James Dietz Handsigned and Numbered Limited Edition Print:"On Patrol"
Size: 15" x 24.875"/ Overall size 21" x 31.375"
About the Art: On March 1st, 2004, members of the 3rd Battalion, 116th Infantry began reporting to armories around the Commonwealth of Virginia to begin their transition from citizen - to full time soldier. The battalion was mobilized in support of Operation Enduring Freedom and deployed to Afghanistan. After training at Fort Bragg and a rotation at Fort Polk's Joint Readiness Training Center, the 3rd Battalion was ready to add its own chapter to the historic lineage of the 29th Infantry Division. The battalion began arriving at Bagram Air Field (BAF), Afghanistan on 15 July 2004 and was quickly engaged in operations. The battalion's first mission was to provide force protection and a quick reaction force at BAF. The other assumed a more traditional infantry role where the battalion was assigned an area of responsibility to capture, kill or suppress the activities of any anti-coalition organizations. In recognition of the 116th Regiment's history, the newly formed Task Force assumed the name of the beaches the regiment stormed more than 60 years prior - Normandy. At Forward Operating Base (FOB) Ghazni, TF Normandy found themselves jumping right into operations and occupying the Spartan conditions at FOB Ghazni. Very limited hot water, latrines, and living space made the transition challenging, but the robust operational tempo and the need to learn quickly kept the soldiers too busy to focus on the lack of amenities. Moreover, the battalion quickly shifted from its traditional light infantry role to that of a medium motorized battalion, receiving a large compliment of up-armored vehicles which played a pivotal role in TF Normandy's ability to maneuver throughout the 30,000 square kilometers area for which it was responsible. 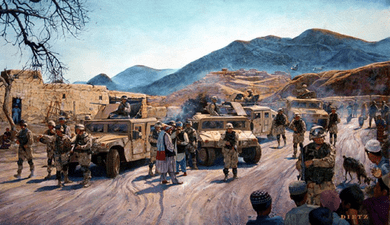 On Patrol depicts a typical patrol conducted by members of TF Normandy throughout the Ghazni and Wardak provinces. At BAF, TF Normandy provided security for over six thousand service members and civilians. It manned 20 towers and conducted security patrols for the bases 6.5 mile perimeter. Shortages of personnel forced Soldiers to endure 12-hour shifts with an average of less than one day off per month. The battalion conducted security and civil engagement patrols in the 10K ring around Bagram that discovered numerous caches and deterred rocket attacks. The 3-116 Infantry provided theater Quick Reaction Force to CJTF-76. This air-mobile force maintained the highest level of readiness and was able to respond to threats on extremely short notice. Missions accomplished included security of IED sites, security of downed-aircraft, and responses to threats in vicinity of Bagram. The QRF also provided security for the President of Afghanistan and for First Lady Laura Bush. Much hard work went into planning and coordinating for the October elections. Many agencies and units were involved, including United Nations, NATO, and other coalition forces and civilian organizations. The scope of TF Normandy's involvement included conducting pre-election day site security surveys, providing security throughout the elections, and escorting several jingle trucks carrying ballots from the remote elections sites to a regional counting facility. The battalion's operations were necessarily immense, but the soldiers responded with the "Let's Go" attitude that had come to exemplify their operations in theater, and, despite determined attempts by anti-coalition organizations to disrupt, the elections were a resounding success. In over twenty company and battalion level operations TF Normandy captured over 70 anti-government operatives. The battalion secured over a hundred caches with over 22,000 mortar rounds, 3,500 hundred rockets, 6,000 recoilless rifle rounds, 230 anti-tank mines, 700 anti-personnel mines, and 8,000 RPG rounds. In addition, the TF also executed over 130 civil assistance projects worth over $1,000,000. On Patrol is dedicated to the members of Task Force Normandy, which adapted to tough conditions and defeated a determined enemy, resulting in a safer and more secure operational area and the strengthening of the government of Afghanistan.